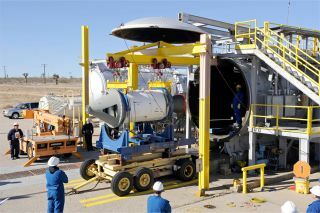 Researchers install a solid rocket motor into an AFRL Rocket Lab altitude chamber at Edwards Air Force Base in California. NEW YORK — The U.S. Air Force Research Laboratory (AFRL) Rocket Lab plays a direct and extensive role in advancing rocket propulsion technology — but you'd never see its sticker on the finished engines. Rather, the lab does fundamental research into solid, liquid and in-space propulsion, and tests out the futuristic technology on the small and extremely large scale at the Edwards Air Force Base in California before passing the results on to aerospace companies. Shawn Phillips, director of the Air Force Research Laboratory Rocket Lab. Space.com: What does the AFRL Rocket Lab do? Shawn Phillips: A lot of people would hear about NASA, the engineering marvels they do. You hear about Aerojet Rocketdyne, you'll hear about SpaceX, you'll hear about Blue [Origin]. But no one's ever heard about where that technology comes from; who's doing the fundamental research; who's doing the demonstrators, the component-level research; and who's really paving the way of what's the next liquid-rocket engine, solid-rocket motor or satellite propulsion system that's out there. That's us. Space.com: So you do fundamental research, build components and demonstrate new rocket technology? Phillips: Yes — and at that point, we don't do the next step. We take things to that level, kind of like a demonstrator level, and then we hand it off to each and every industrial company that's interested in it. So even if we have a contract with an Orbital ATK, an Aerojet Rocketdyne, all of [the] industry gets the technology that the Air Force developed … so the transitions are successful and everybody's on the same page. Our researchers will publish in top-rated fundamental journals. But then, at the same time, we also have the testing capabilities to do everything. We do things from nano-newton thrusters for in-space, that basically couldn't lift a piece of paper, all the way to — we have the capability to test up to 10 million lbs. [4.5 million kilograms] of thrust, which really is equivalent to about 123 Hoover Dams going at once. Space.com: What would a test site for that even look like? We're out in the middle of the Mojave Desert, so there's good and bad. We're in the middle of nowhere, so human encroachment is not an issue … [and] the test stands we used in the 1960s and '70s are still good because we don't have rust. There's no humidity, there's no moisture buildup usually, and so those test stands can last for that long. And these test stands can take, these days, upwards and past a quarter of a billion dollars to build. An AFRL Rocket Lab sub-scale oxygen-rich preburner test, as part of their effort to replace Russia's RD-180 rocket engine, used in the Atlas V launch vehicle's first stage. Space.com: And that can accelerate the development of new tech? Phillips: A lot of times, companies and even the rest of the government will be constrained by timelines. And so our job is to have everything prepped for them so that when they're ready to go to the next thing — like when they have to go demonstrate a launch vehicle, demonstrate a new liquid rocket engine — that we can transition all the technology we have to them, reduce the risk for them so they can actually go forward and develop that component. Because the companies are not going to want to invest five years and anywhere upward of $15 million on addressing combustion stability, which is really when you put your fuel and oxidizer together, they react. Only you're doing this at thousands of degrees and also thousands of pounds per square inch. If they react badly, you detonate. So you really want to understand the physics first, and what's going on and how the mixing phenomenon happens. That's what we do. Space.com: That requires predicting what everyone's going to get to next, right? Phillips: What we are successful at, really, is predicting the future or having the crystal ball. It looks like it's something magical, it looks like something that you just stare in to see how you get from Point A to Point B, but there's a lot of work that goes into that. How we predict the future, really, is we develop the trade space, not the point design. A lot of people look and say, "I want this," but in 17 years, "this" is no longer valid. So we say, "OK, you want these set of things; let's pull it down to requirements." … You can pick from a suite of technologies we tested and decide what you really want. Right now, we're trying, as a nation, to come up with a way to not be reliant on the RD-180, the Russian engine. Our job is to say "OK, we have developed this component, and all the understanding of the technology for you for that one." But there may be something else, like reusability, where we say, "That's not really important for the Air Force right now, so we're not going to demonstrate a lot of reusability goals for right now." But we carry things along in the trade space until we get to the final point where it looks like it'd be a nice transition for our customer, which, in this case, is the [Air Force's] Space and Missile [Systems] Center. Space.com: Are you working on something to use in U.S. rockets besides that Russian engine? Phillips: Our program, the Hydrocarbon Boost program, really is to replace the RD-180. The way I can liken this to you is, the U.S. has an industrial base of building something like a semitruck engine. The Russians have a Lamborghini. There's no way to deny that. That is a beautiful system, that engine, the RD-180. So we have experts on how to build truck engines, not Lamborghinis. We have to retool the entire industrial base and our knowledge to be able to work on this ox[idizer]-rich staged combustion engine, which is really to work on Lamborghinis. I love the semitruck. This thing is big, powerful; it's got us to the moon. It's got us to space with the [United Launch Alliance] Delta IV [rocket], with the RS-68 engine that's in there. But we do have the fundamental issue … that we want to move to that higher-performance engine. Hydrocarbon Boost is doing all the development work so that we have an industrial base that understands how to do ox-rich staged combustion, and how to test out every one of those components to show that they work and then work in an integrated system. And then we hand that to every industrial partner, and they get to use that in their designs as they go forward. Each one will take some parts, [and] they can decide what they want to use as they develop theirs. Space.com: When might we see some of this showing up in actual rockets? Phillips: We have a need by 2022, where the U.S. wants to launch a vehicle with an engine to replace the RD-180 and/or the Atlas V. SpaceX, as you are aware, is looking at a completely new vehicle, the Falcon 9 Heavy, whereas ULA [United Launch Alliance] is looking at the Vulcan to replace it. But they may use either Blue Origin's engine, the BE-4, or they may use Aerojet Rocketdyne's AR-1. You could see the technology any time in that 2022 time frame. This is what we'd typically see with liquid rocket engines — we typically have a changeover in launch vehicles for the nation about every 20 years. It's like 17.5, 18 years. You're not going to see rapid transitions, because technology takes that long in developing rockets. [For] solid rocket motors, it's about 10 to 15 years, and for in-space propulsion, satellite propulsion, you can see transitions at 5- to 10-year marks. A laboratory-scale liquid rocket engine test at AFRL Rocket Lab. Space.com: So what's the future of rocket propulsion? Phillips: If we say we have a "crystal ball," then we have to actually come out and say "Here's what it is." Modeling and simulation have done a complete paradigm shift in how we do rocket development, [and so has] additive manufacturing [aka 3D printing]. We know that with rockets, we're doing one-off designs. We need to take advantage of additive manufacturing — we're going to what we want to call "modular rocket engines." We can't afford rocket tests that can cost over a billion dollars anymore, so we need to take advantage of modularity. We don't want to just cluster engines; we want to build the components, test them out at the smaller level, because it's lower-cost, and then put them together in an integrated system and fire them. Space.com: What about in-space propulsion, like satellites? Phillips: That's a fun one to predict. We developed one of only two green propellants for in-space chemical propulsion. Right now, we use something called monomethylhydrazine, and the good news about that is that if you inhale it, it could kill you in a matter of minutes. … We developed a green propellant that actually has better performance, but also goes from having one of these what they call Class A scuba suits, which basically are fully encased breathing apparatuses, to where all you need is a face shield, latex gloves and a regular splash guard and that's it; you're good. That's the future. And we're actually flying that with a NASA mission called GPIM, the Green Propellant Infusion Mission, in 2017 — on a Falcon 9 Heavy, by the way. It's going to launch us up there. That's where the future is — we're getting away from the toxic propellants for in-space chemical. For electro-propulsion, we're looking at taking advantage of what a lot of [the] industry has done, but also academia: what's called electrosprays. These things are very low-thrust, but there's a lot of reasons the Air Force may need them, so we're learning how to optimize that thrust — fundamental science to explore the physics behind the generation of those particles, and how you actually eject them out of the thruster. Ideally, in the future, you'd want a system that has both [electrical and chemical propulsion], and that's the beauty of what we're trying to work toward here. Space.com: How do you fit in with the new private spaceflight companies? Phillips: The new entrants really don't want traditional government contracts, so when we have something out, they're not going to be interested in that. What we had to do is change our mindset on how we deal with technology transition to them. And so we work a lot on joint research — cooperative research and development agreements. Those are called CRADAs. Basically, we have agreements that are more [like] sharing technology, exchanging it as opposed to them having to be on a government contract. Some of the companies don't like us to — even though we work with them, they want to keep kind of hush; it's the competitive edge. Other companies are very open. But I can tell you right now, almost all the companies work with us, whether through an official contract or through these cooperative research agreements. Phillips: People need to understand that there actually is this organization out there that is doing this work and addressing these issues. You may never see us; you may never know what's going on with us. But we are at the forefront of technology to develop the things that will keep our nation ahead of our foreign competitors, our foreign adversaries.